I find that intensifying competition induces agents to produce original, untested ideas over tweaking their earlier work, but heavy competition drives them to stop investing altogether. Although intrinsic motivation can be valuable, this paper shows that winner-takes-all competition can motivate creativity, if properly managed. We can speculate that a few (perhaps even one) competitors of similar ability is enough to motivate creativity, whereas many strong competitors may discourage this effort. Är konkurrens företag emellan viktig för ekonomisk tillväxt? Den saken undersöks i ett såväl historiskt som modernt perspektiv i studien ”British Relative Economic Decline Revisited”. Begreppet konkurrens förstås i vid mening och innefattar sådant som rätt att starta företag och gå in på existerande marknader (dvs. frånvaro av vissa typer av regleringar) och att staten avhåller sig från att konservera existerande industristrukturer genom stöd och industripolitik. The results of the “Thatcher Experiment” in the 1980s make the case and paved the way for reversing relative economic decline. Competition was much strengthened by ongoing trade liberalisation, deregulation, and discontinuing 1970s’ industrial policy. As competition strengthened, there were major changes in industrial relations which were associated with organisational change, together with divestment and restructuring in large firms. At the sectoral level, stronger competition and greater openness were correlated with improved productivity performance. As the age of information and communication technology came along, Britain was able to embrace the opportunities associated with rapid diffusion of the new technologies, which required big changes in working practices and management hierarchies, better than its continental-European peer group. This would not have happened with 1970s-style industrial relations and a heavily-regulated service sector. Kan Thatchers inriktning mot reformer som ökade konkurrensen bero på hennes insikter om entreprenörskapets betydelse? This paper has analyzed the effect of small shifts in entry cost in a dynamic stochastic model of heterogeneous firms with technology adoption. 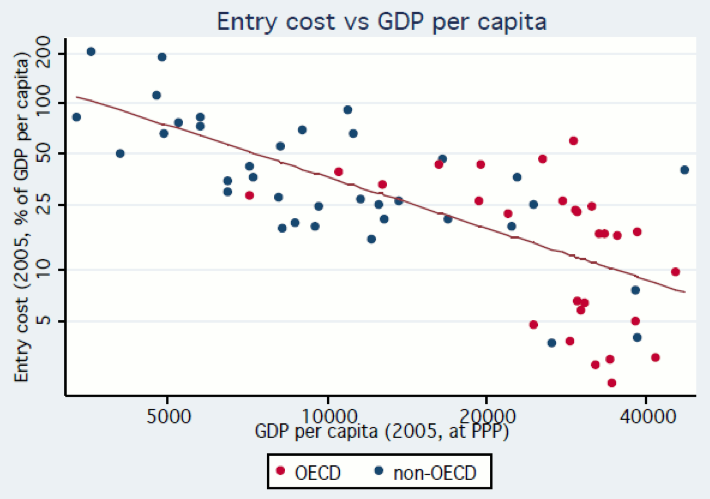 Results fit the observed patterns qualitatively, and correspond to 10 to 20% of observed differences: a country with lower entry cost has higher productivity and output despite lower capital intensity, and it has higher ﬁrm turnover. Notably, the consumption loss caused by increasing administrative entry cost is a multiple of the direct burden of the regulation. Studien klargör vikten av ett enkelt, lätthanterligt och transparent regelverk för nya företag som möjliggör konkurrens. Our results indicate that the share of schools that are privately operated has an economically and statistically significant positive effect on student achievement in mathematics, science, and reading … Importantly, much of the positive effect of private school shares accrues to students in public schools, suggesting that the overall effect is not simply due to privately operated schools being more effective, but rather it reflects benefits of competition. … Interestingly, descriptive evidence also suggests that a larger share of privately operated schools is also associated with a strong reduction in the dependence of student achievement on socioeconomic status – as long as all schools are publicly financed (Woessmann et al. 2009). In other words, the additional choice created by public funding for privately operated schools seems to particularly benefit disadvantaged students and thus boost equity in the school system. Dessa resultat är helt i linje med en tidigare studie av effekten av friskolor just i Sverige. Den som motsätter sig friskolor får gärna klargöra på vilken grund, givet vad forskningen verkar visa om deras effekter. I argue that the IPCC has a natural monopoly, as a new entrant would have to invest time and effort over a longer period to perhaps match the reputation, trust, goodwill, and network of the IPCC. The IPCC is a not-for-profit organization, and it is run by nominal volunteers; it therefore cannot engage in the price-gouging that is typical of monopolies. However, the IPCC has certainly taken up tasks outside its mandate; the IPCC has been accused of haughtiness; innovation is slow; quality may have declined; and the IPCC may have used its power to hinder competitors. There are all things that monopolies tend to do, against the public interest. The IPCC would perform better if it were regulated by an independent body which audits the IPCC procedures and assesses its performance; if outside organizations would be allowed to bid for the production of reports and the provision of services under the IPCC brand; and if policy makers would encourage potential competitors to the IPCC. Jag instämmer, inte därför att jag misstror IPCC:s övergripande slutsatser, utan därför att jag anser att man som lekman i regel bör underordna sig experters kunskapsutlåtanden. Kan man förbättra den process genom vilken experterna kommer fram till sina uppfattningar är det inte minst viktigt för den okunnige lekmannen, men också förstås för politiker som fattar beslut. The results suggest that competition translates into higher wages, also for teachers in public schools. While the average increases are modest new teachers gain 2 percent and high ability teachers in math and science receive 4 percent higher wages in the most competitive areas compared to areas without any competition from private schools. Jag har tidigare rapporterat att svenska lärarlöner är låga. Högre och mer differentierade löner kan nog påverka vilka som väljer att bli lärare, vilket kan ha effekter på kompetensen och kvaliteten på undervisningen. Det är inte minst intressant att även kommunalt anställda lärare berörs (liksom elever i kommunala skolor tycks beröras av förekomsten av friskolor). Det ska bli intressant att se om farmaceuter får uppleva en liknande löneeffekt i det nya, omreglerade apotekssystemet.